Whether you are searching for a new spiritual home, looking for a unique wedding venue, or are a student of architecture, you are bound to find something of interest here. Located on Madison’s near-west side, First Unitarian Society is one of Madison’s best known and most visited buildings. In a given week, you’re likely to find FUS playing host to weekly congregational worship services, religious education classes, concerts, and social events. 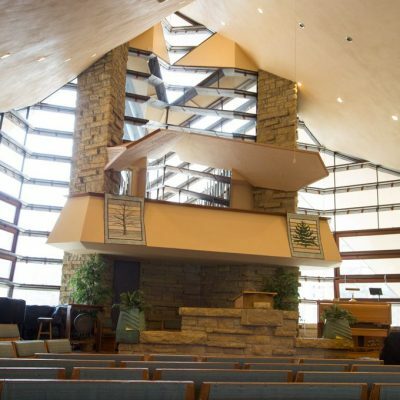 First Unitarian Society is home to the Meeting House Nursery School and Congregation Shaarei Shamayim. The historic Landmark Auditorium was designed by Frank Lloyd Wright, a member of our Society and son of one of our Founders. 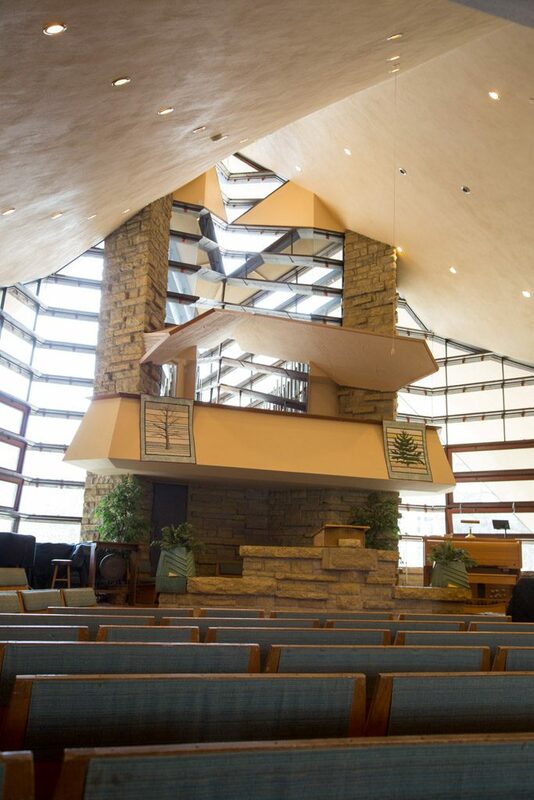 It is recognized as one of the most innovative examples of church architecture. Saturday services are held in Wright’s original Landmark Auditorium, as are Friday noon musicales and a host of other events. 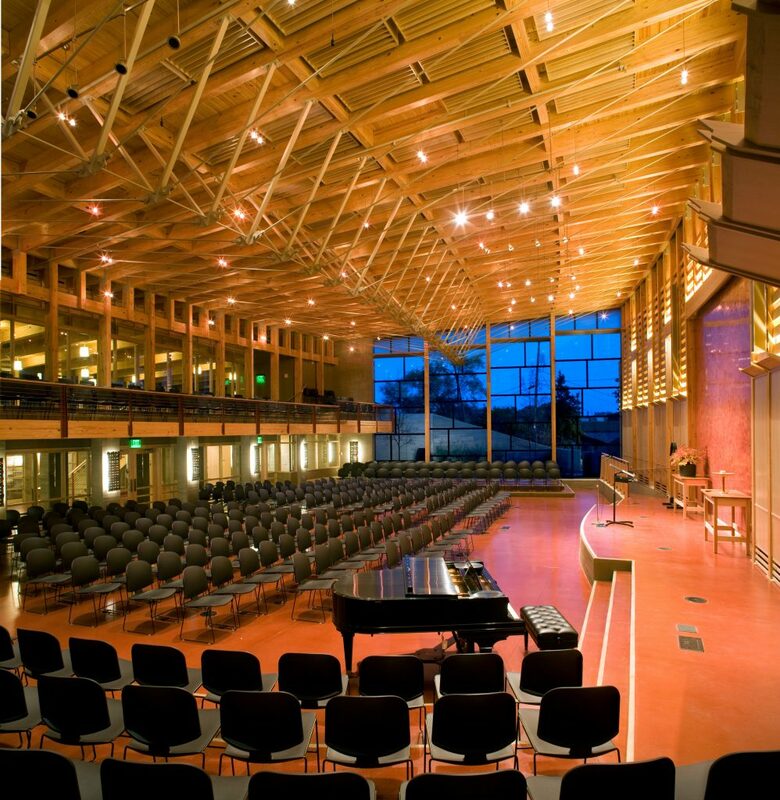 Inspired by Wright’s original work, the Atrium Addition was opened in 2008 boasting a Gold-level LEED certification. The 24,000-square-foot Atrium is home to our Sunday morning services, as well as a host of other events and activities. Along with the Auditorium, the Atrium addition is also home to our children’s education classrooms, our library, and a state-of-the-art kitchen. Weekday tours are held twice daily at 10:30 a.m. and 2:30 p.m., from May 1 through September 30 and are $10 per person. Calling ahead is recommended to ensure a guide is available and the building is not in use for private events. Sunday tours meet in the Atrium Auditorium at approximately 10:15 a.m. and 12:15 p.m.
We do not currently offer Saturday tours. Find out more about organizing a custom tour. Spaces for 4 to 400 people are available in our facility. Whether you are planning a wedding, a concert, a public lecture, or a simple meeting, we can offer a venue that meets your needs. The Meeting House is surrounded by a prairie, which provides a picturesque backdrop for events. Is our space perfect for your next event? Find out about building rentals here.